As I mentioned a couple times before, I try to prepare some vegetarian meals from time to time, always looking for new ideas, cos lets be honest – I’m a carnivore and I like “my piece of meat.” Thought as scientists and Cookies says – “it’s healthy for you!” I can’t disagree, so I hunt for ideas that suit both our palates. 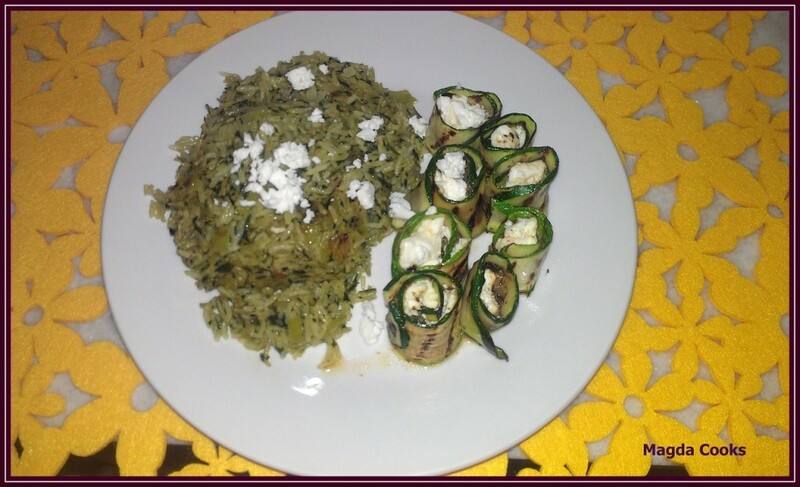 This time I made zucchini rolls with feta cheese and as a side dish I choose some awesome looking green mexican rice. And as you can see the whole dish is spectacularly gorgeous 😉 and it tastes as good as it looks, believe me, we both were astounded how a mix of delicate, almost sweet baby zucchini contradicted the salty flavour of feta and the basil taste of pesto. Start with rice, cos with zucchini you won’t have time for paying attention to anything else. Cook rice 4min less than the instruction calls. drain and set aside. Chop onion and pepper, set aside. Roughly chop parsley (you can add cilantro as well) and put into blender, add cayenne pepper, garlic powder or clove slightly chopped or mashed, and in the end add bouillon. Mix good until its nice and green. Heat oil on a pan with high sides, add onion and then fry for a minute. Add pepper and fry for another minute stirring often. Add rice and coat it good with oil, onion and pepper, fry together for another minute or two. Poor in green mixture and stirring, cook until the rice is greenish and soft. Set into warm spot. Now the zucchinis. Cut the ends, take either veggie peeler or cheese cutter and slice long slices of the zucchini. Set on the board, pour oil into small bowl, using a kitchen brush smear one side of the slices with oil, but not too much! Put it on a hot grill pan and grill until pretty dark stripes shows, flip it and now work starts. Brush whole slice with pesto, add some feta cheese on one side and wait until grilled – I believe its max 2 min. Take it slowly of the grill and set on the board, roll it straight starting from feta end and place on the plate vertically. Repeat until you use all the pieces of zucchini and most of the feta, or even all. Serve with hot green mexican rice decorated with anything you want, I had some feta left. Enjoy a simply gorgeous and full of flavor vegetarian meal. P.S. Cookies thoughts: I love my vegetarian style meals a lot. This one really rocked. I was skeptical , but it turned out something out of the ordinary. Magda Cooks… it just right.